I have found, though, that one inevitably does, and should, make this portrayal personal. We are actors, not robots, and any characterization, whether historical person or character on a stage, draws on the personality of the actor to some extent. After fifteen or so years of “being” Benjamin Franklin, I find myself quite surprised to see more and more similarities between his thinking and my own. Chicken or egg? 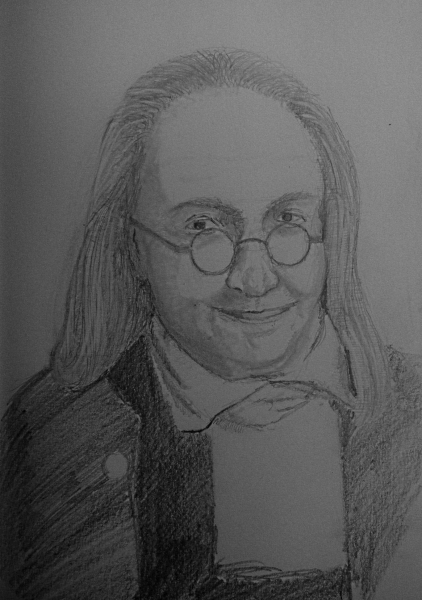 Has my mindset become more Franklinian, or was I first attracted to the character of Franklin because I sensed a like mind ( “like” in terms of philosophy, quality.) I suspect that there are elements of both.